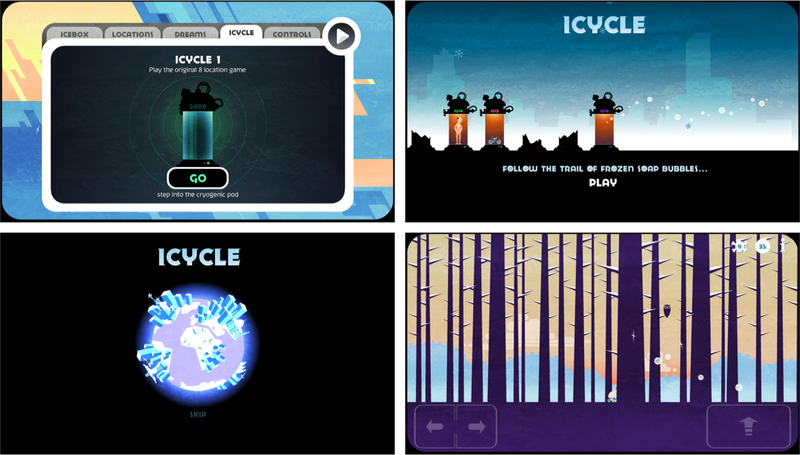 Icycle: On Thin Ice ($0.99 Universal) is a platform based ice adventure that has all of its bare essentials covered. Or at least that is the challenge: to cover the bare essentials exposed within the game. 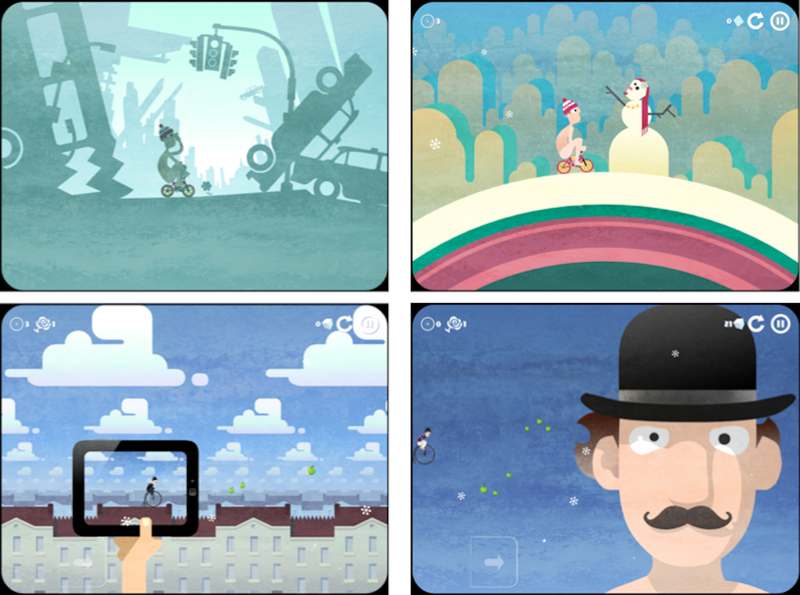 In a game that attempts to recreate the craziness and brazen naturism of the polar bear club, the hero of the game starts out wearing little more than the bicycle he is riding on. Unlike the foolishness that defines members of the ice-crazed polar bear club, you are trying your best to stay out of the freezing water under the ice. To do so you have three simple controls; two left and right directional buttons on one side of the screen, and one jump control on the other side of the screen. The controls can be flipped from side to side in the settings depending on your preferences. Holding down the jump control for extended periods of time will reveal an umbrella that can be used as a glider to control your fall from the high frozen peaks in each environment. There are more than enough bizarre things to encounter with each new level. The mastery that is expected from a scantily dressed cyclist when it comes to traversing near vertical inclines is impressive to say the least. There are times when new ice pillars will spring up from the ground, producing death-defying spikes that you must avoid. Just as unbelievable as the skills demanded on your bicycle is how far you are expected to glide with the aid of your trusty umbrella. You soon get use to trying different things in this surreal ice world that you would never try in real life. 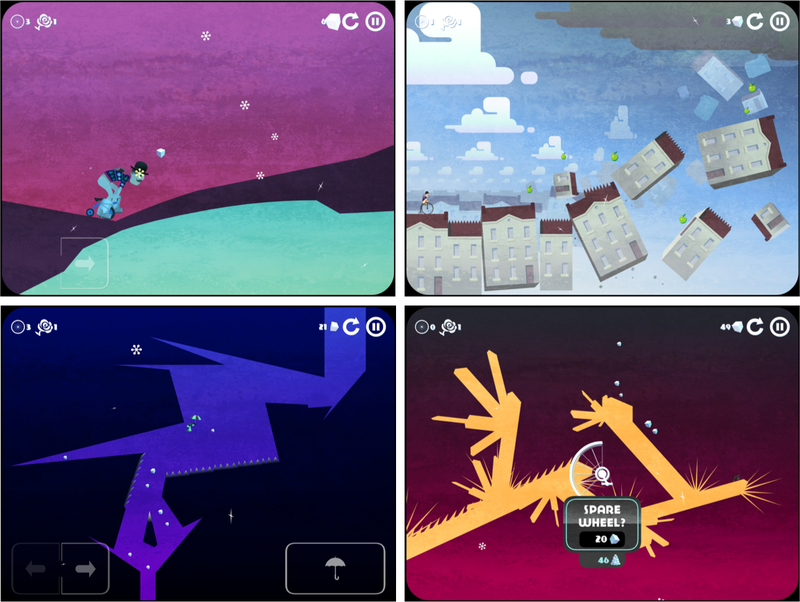 like jumping from one ice platform to another and gliding across great divides that can span beyond the edges of the screen. As you progress through each level, you collect ice cubes with a vacuum cleaner; that’s right, a vacuum cleaner. What would you expect? You are after all a nearly naked man riding a bicycle through a frozen wonderland. The collection of ice cubes can then be used to purchase power ups in the form of warmer clothes, faster bikes, loftier umbrellas and more powerful vacuums. When you do have enough ice to make such purchases, hidden areas on levels you have previously completed become accessible. For instance, with more powerful accessories you can jump and glide into areas that never knew existed the first time you played each level. Some levels may prove to be more of a challenge than others. 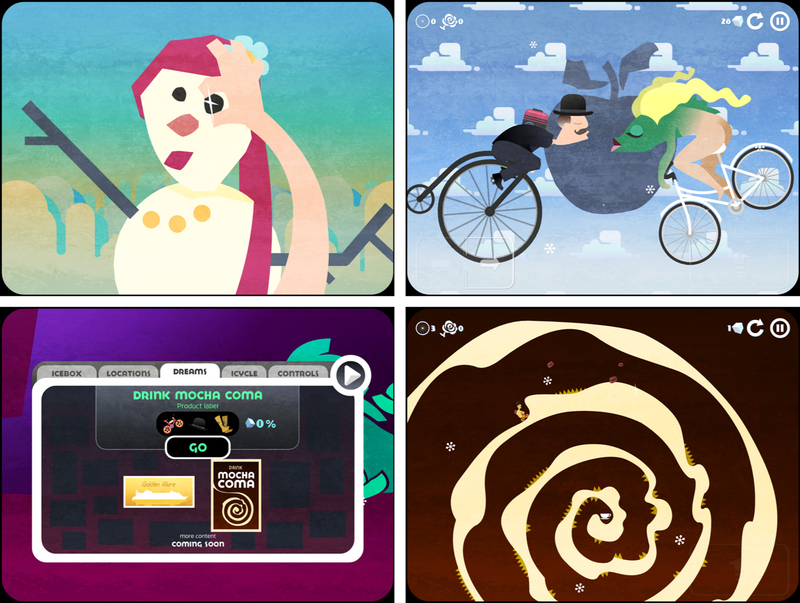 You have four lives to complete each level starting at various checkpoints within the levels. Once your four lives are up, you do have a chance to purchase a “spare wheel” in order to keep trying from the last checkpoint you made it to. Each spare wheel you purchase will cost you more ice cubes than the last. Upon completing each level you will be rewarded with a series of four snow flakes that signify the accomplishment of various challenges you have mastered within each level. Finish a level without using your umbrella, performing a small number of jumps, and collecting a high number of ice cubes are a few examples of the challenges you face. The snow flakes you earn will then unlock additional levels in the game. Using different combinations of the items you have purchased with your ice cubes, you can unlock different dream levels. These dream levels play out in a similar fashion to the progression of locked level locations that you face in the main part of the game. Counting up your snow flake achievements to eighty will also unlock the original eight level adventure that started it all. There is certainly more ice than modesty to be had in this weekends reminder of just how hold things can get.